If you’re looking for a pre-assembled USS Constitution model ship, you have a few choices. There are a number of reputable model ship companies, such as Old Modern Handicrafts and Handcrafted Model Ships, that make great USS Constitution models. There are also a number of companies that make cheap knock-offs that look nothing like the original ship. If you can’t decide between buying a pre-assembled model or a USS Constitution model kit, the upside to buying a fully assembled model is that the USS Constitution is a very complex ship and building a model of it is very challenging and definitely not for beginners. With a pre-assembled model, you can still have a beautifully crafted ship for about the same price as a model kit but without any of the hassle or headache. This 24 inch USS Constitution Model ship by Hampton Nautical is their best-selling USS Constitution model. The ship comes fully assembled and was built from scratch by master artisans. The ship is made from high quality woods such as cherry, birch, maple and rosewood. It has 23 stitched, heavy canvas sails and taut rigging with varied thread gauge and color. The gun ports actually cut into the hull of the ship and it has an authentic scale life boat. The ship also comes with a wooden display base. The model is designed and painted to look as the Constitution looks today, or at least close to it, with a white band along the gun port and black paint on the upper part of the hull. On the lower part of the hull, the model doesn’t look exactly as the ship does today because the actual ship has a red anti-fouling line at the waterline mark and a copper bottom while the model is just painted dark brown or copper-colored with no red line. This red anti-fouling line, which prevents any marine growth at the ship’s waterline, was first used on the ship in the 1973-1974 restoration. None of the Constitution models for sale have this detail probably because it is not considered historically accurate or simply because it serves no actual purpose on a model ship. On the bow of the model, the billethead and curling leaf motif on the trailboards are also the same as that on the actual ship. The stern on the model is also designed to look as it does today with white molding along the edge, a white eagle near the center and three windows accented by white cast pillars. The model has great reviews on Amazon with 4.2 stars. Many reviewers have mentioned the ship’s high quality and great details. Hampton Nautical sells similar USS Constitution models in various sizes such as 30 inches, 15 inches, 10 inches, 7 inches and 4 inches and also sells a 4 inch USS Constitution Christmas ornament and a USS Constitution ship in a bottle. This medium-sized USS Constitution Model Ship by Old Modern Handicrafts is their best-selling USS Constitution model. The ship comes fully assembled and features a plank-on-frame, two decks, and a row of metal cannons on each side. 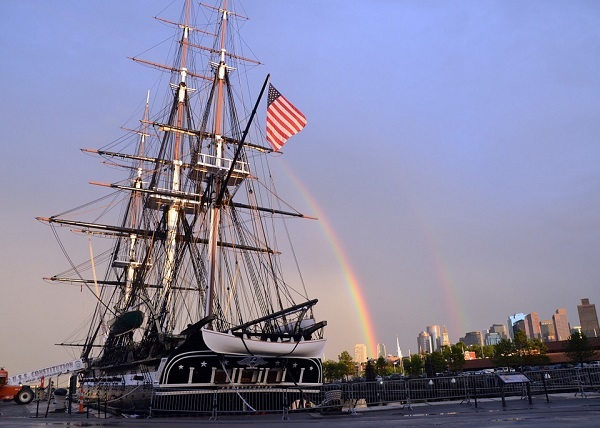 The model is made from high-quality wood such as western red cedar, rosewood and mahogany and is hand built individually using the similar plank-on-frame construction method used in the construction of the USS Constitution. The model also has hand-stitched, rolled-up sails made of linen as well as rigging that has been knotted and fastened by hand. In addition, the ship has an American flag attached to the mizzen yard, hand-built life boats with ribs and planks, metal steering wheels, metal anchors, a metal bell, a wooden rudder, captain’s dining quarters and sleeping quarters and admiral’s quarters on the stern. The model is designed to resemble the ship as it appeared in its glory days, between the time of its construction and the War of 1812. The model’s stern has windows, as the ship is depicted having in the first ever painting of the ship, painted by Michel Felice Corne in 1803, and an eagle motif in the center of the stern near the traffail. The manufacturer has not painted the model and instead left it natural, probably to highlight the beautiful wood it is made of and to show off the detailed planking job on the hull. The model’s bow has the same curling leaf motif on the trailboards and the same billethead that was installed on the ship in 1804, which makes me think this model is not based on the ship’s original appearance in 1797, which featured a Herculean figurehead on the bow, and is instead based on its early 19th century appearance. The model also has windows on the quarter-galleries, which the ship did not appear to have until sometime in the early 19th century. This model is an “exclusive edition” where each model has a unique serial number etched into the hull that allows the company to identify the production date, material used and etc. The model is built to scale by master craftsmen using historical photographs, drawings and original plans. The model measures 29 inches long, 10 inches wide and 25 inches tall. Old Modern Handicrafts sells similar models of the USS Constitution in various sizes such as small, large and extra large and also sells a cross section model. If you’re looking for a smaller and more affordable model, this model is a great choice for you. This 7 inch USS Constitution Model Ship by Handcrafted Model Ships is their best-selling model of the USS Constitution. It is also one of the more affordable models you can buy that most closely resembles the actual ship. The model features wooden masts, spars, base and deck. It has taut thread rigging, rope ladders and comes with all sails mounted. The model has been hand painted to resemble the actual ship as she looks today with a white band along the gun port, black paint on the upper part of the hull and copper-colored paint below the water line. The stern on the model is difficult to see in the product photos but appears to resemble the stern on the modern day ship with a white molding around the edge of the stern, three windows and an eagle in the center of the stern. The model’s bow also has the same billethead and curling leaf motif on the trailboards as the modern day ship. This model measures 7 inches long, 2 inches wide and 5 inches high. Handcrafted Model Ships actually owns Hampton Nautical and many of their ships are similar or the same. In fact, Handcrafted Model Ships actually sells another 7 inch USS Constitution model ship, under the Hampton Nautical name, but it pales in comparison to this model even though it’s in the same price range. The Hampton Nautical 7 inch model sells far better on Amazon but I suspect that has more to do with the free shipping than the model itself. This model features far more detail, a much better paint job and more closely resembles the actual ship, so if you’re looking for a model in this size and price range, definitely go for this model instead of the Hampton Nautical one. This by LK Scale Models is a limited edition, sells well and has great reviews. The model features intricate detailing for a model of this size. The company doesn’t mention what the model is made of but reviewers on Amazon state that the hull is made of resin and the deck and other pieces are made of wood while the guns and anchors are metal. The model has been painted to resemble the actual ship as it appears today with a white band along the gun port, black paint on the upper part of the hull and copper-colored paint below the waterline. The stern of the model also resembles the modern day ship’s stern with white molding around the edge of the stern, three windows and an eagle in the center of the stern. The model also has the same windows on the quarter-galleries and the bow of the model also has the same billethead and curling leaf motif as the modern day ship. This USS Constitution Model Ship by GSM is affordable considering its size but the body of the ship is greatly lacking in detail. I also can’t seem to find any information on the seller or manufacturer so I don’t really know what to make of them. The model is made of wood and has cloth sails. It also has an anchor, rope ladders, the ship’s wheel at the back of the ship and a name plate on the wooden base. The model has far fewer gun ports than the actual ship has. The model is painted to resemble the actual ship as she appears today with a white band at the gun port, black paint on the upper part of the hull and light brown paint below the waterline. Yet, the model has no decoration or windows on the stern and the bow has a simple squiggly line that somewhat mimics the actual ship’s curling leaf motif on the trailboards. The model comes fully assembled and measures 13 inches long, 3 inches wide and 12.5 inches high. 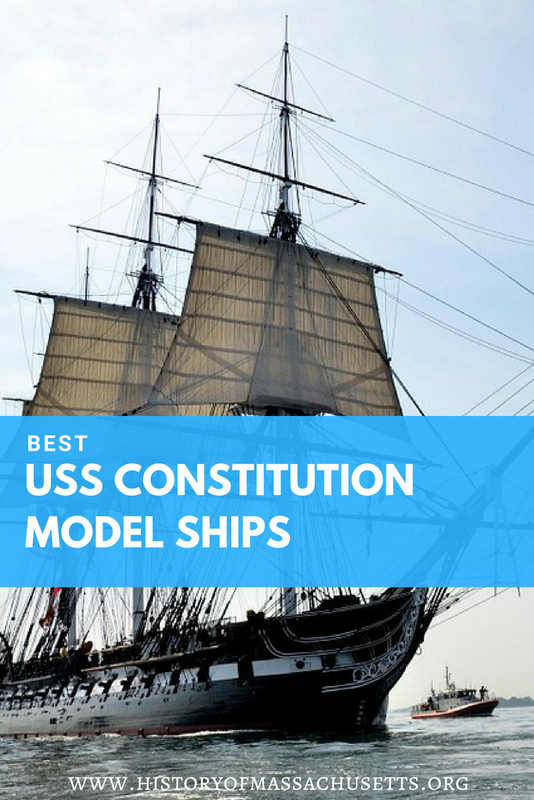 Hopefully this article will help you find just the right USS Constitution model you’re looking for. Remember to take care of your model ship by dusting it often using a cotton swab, clean paintbrush or a can of compressed air. One of the best ways to protect your model ship is to house it in a display case, such as this Old Modern Handicrafts display case for tall ships or a similar case. This will not only prevent dust build up, which can make the rigging sag over time, but will also prevent anyone from touching or damaging the delicate model.